If you want to use MacBook Air as a main machine, SSD volume should be 256GB or higher. Now you can choose 256GB at most when you buy MacBook Air, but if you didn't, you can replace the SSD. You may want to choose third parity's SSD, that's one way. But you should consider reliability. Probably, the best reliable SSD for MacBook Air 2010/2011 is Apple genuine one. This SSD is the same as Apple genuine one, and it's very reliable. If you don't want to lose your data, that's very important. 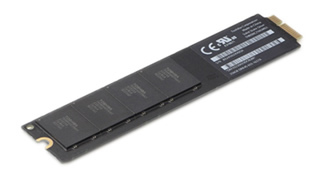 This SSD is compatible with all MacBook Air Late 2010/Mid 2011. Some sources say that the genuine 256GB SSD is not compatible with 11 inch 2010 model, but it's not true. We acctually tested it with the model, and no problem. This is very good upgrade for all MacBook Air 2010/2011 with 64GB/128GB SSD. SSD starts looking more like traditional RAM chips, future SSDs will probably cause RAM to disappear.